Introducing Tsubaki's new KF Series BS Lambda Chain, which conforms ISO606 standards. BS Lambda Chain that can be used in the food industry and in high-temperature environments. Uses environmentally friendly NSF-H1 certified food grade oil for use in food applications. Use special oil impregnated bushes. Since no additional lubrication for the chain is required, there is no mess on the equipment to help maintain a clean work environment. 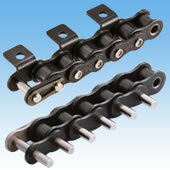 Available sizes: RS Series attachment chain from RS08B to RS16B-LM. Chains with special attachment shapes, special extended pins, BS/DIN series Double Pitch chain, RF06B, RS20B, and RS24B attachment chain, and other chains not shown above available. Please contact a Tsubaki representative for more information. Please confirm attachment dimensions before replacing standard European attachment chain with Lambda Chain, as Tsubaki standard dimensions may differ. Chain wear life will be dramatically reduced above 230°C. Please refrain from using Lambda Chain over 280°C due to possibility of generating toxic gas.